Provence Cosmetics is located in the South of France. Their laboratory develops skincare and bodycare products that are founded on the most advanced biotechnology and formulated with rare and precious ingredients such as vegetable complexes, plant, flower, fruit and marine complexes. The Skincare and Bodycare treatments are not only innovative but combine BIO-technology with natural ingredients that... work immediately and effectively to revive your skin. Provence Cosmetics collection includes products which are dedicated to Beauty Expert. An Expert will select the Expert Treatment best suited to your skin and will recommend your personalized Home Care. The Beauty Expert line is exclusive to the best Spas and Salons. All Products are formulated and made in France.. The high quality and high level of active ingredients used within the professional products makes them some of the strongest Professional products available ensuring that the treatment that you receive in salon is the best that it possibly can be. The perfect mix of skincare products to help keep your skin looking and felling vibrant and wonderfull. Provence Cosmetics have covered all the bases with thier near magical retail range, everything you need for healthy, youthful looking skin. A Clinical test was conducted on 14 women to evaluate action of the facial. 94% felt skin was firmer and more radiant. 100% thought skin regained its youthful Look! Copyright 2012 all rights reserved. Product related data is courtesy of Provence Cosmetics. Course of Bioslimming Professional Treatments combined with Bioslimming Trio. When you get to your desired size maintain with the use of Control Shape. Your Bioslimming Professional will be able to advise on the number of treatments required. 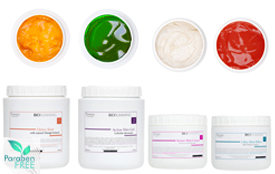 Course of Bioslimming Professional Treatments combined with Bioslimming Trio. Maintain results with Bioslimming Trio. Your Bioslimming Professional will be able to advise on the number of treatments required. Use Bioslimming Trio prior to workout/fitness regime and apply Bodypro50 Ice Flow Gel at the end of the session to aid muscle recovery. Bioslimming Trio and Ice Flow Gel = Improved Results & Performance. Reached a plateau whilst dieting? Boost your inch loss and weight loss with Bioslimming. Try a couple of Bioslimming Professional Treatments and/or use Bioslimming Trio to boost your metabolism and aid fat burning. It’s a secret that you will want to share. Been on a diet and got to your desired weight? Been on a diet and got to your desired weight? Maintain your results with the use of Control Shape. Likewise if you have been on a diet and reached your target weight but still have a few lumps and bumps that don’t seem to be shifting despite the weight loss try the Bioslimming Trio and target those specific areas with precision. Achieved inch loss & looking to maintain results? If you've achieved your desired size and your looking to maintain it, the Control Shape is the product for you. It has a slimming and firming action which limits the storage of fat by acting on Lipolysis stimulation, helping you to keep your figure once you've achieved it.